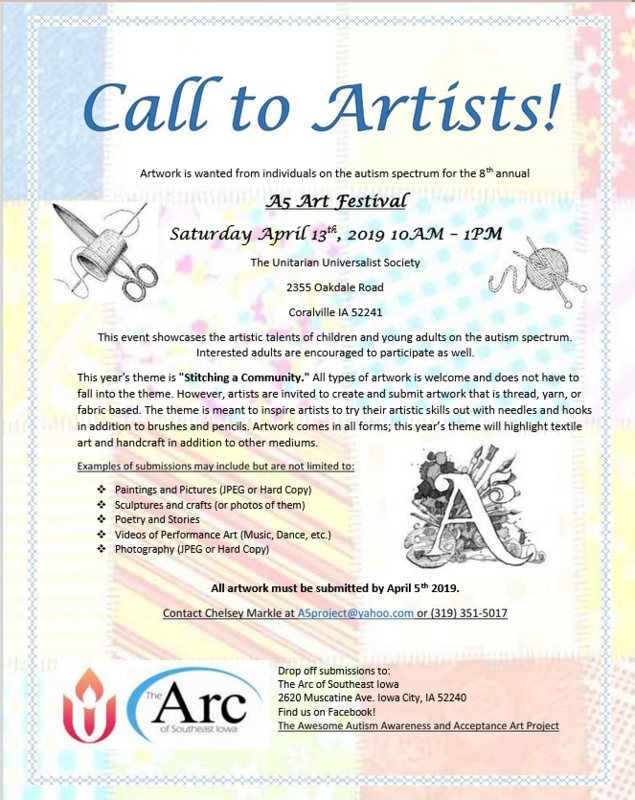 The A5 project (Awesome, Autism, Art, Awareness, Acceptance) is a yearly community festival sponsored by the Arc of Southeast Iowa that celebrates the artistic talents of children on the autism spectrum. The Iowa City Autism Community is also proud to be a co-sponsor of this show. 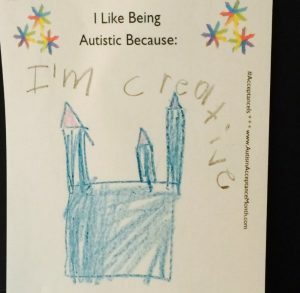 The mission is to showcase artwork done by autistic children and young adults on the autism spectrum in order to promote community understanding and appreciation of autism. This event also has craft and activity tables, music, food, therapy animals is always FREE and open to the public. 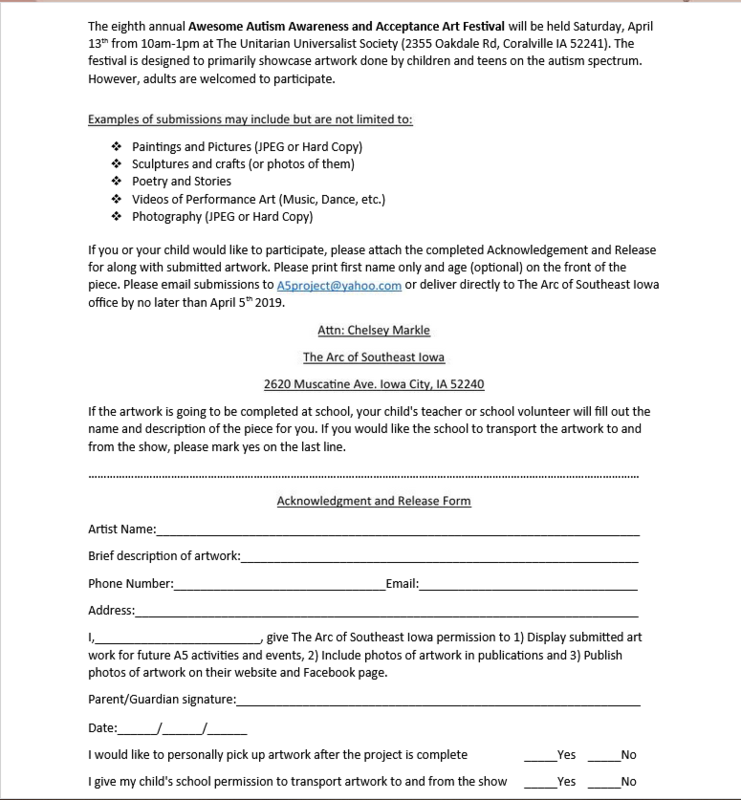 Please print and fill out the following forms and submit them to the Arc of Southeast Iowa main office located at 2620 Muscatine Ave. in Iowa City. Contact Chelsea at 1-319-351-5017 for more information! In the past, we have had the honor of having Miracles in Motion, Childserve, The Wendell-Johnson Speech and Hearing Clinic, Winds of Change Pet Therapy, and many more help make things possible. We could not make this show happen without their volunteered generosity. Many original works of art can also be seen on display in the Iowa City Public Library, The Coralville Library, Hills Bank and more after the show! Keep up to date with our blog and check the Facebook page for more details. We also host many opportunities to create artwork throughout weeks prior to the A5 art show. 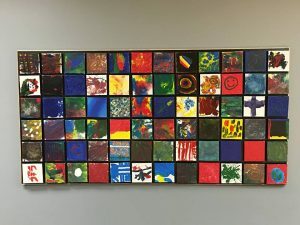 Children in the Iowa City Community School District may have a chance to create artwork for the show in the classroom. Contact your individual school for more details. 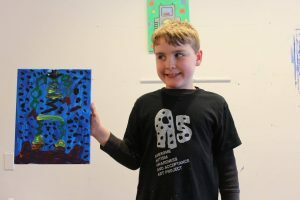 Also, check out our blog and calendar for these often FREE opportunities for your child to make some artwork to display in the show. The Brush and Barrel has reduced price painting workshops for individuals on the autism spectrum as well. This year, the A5 Show is being generously hosted by the Unitarian Universalist Society in their beautiful new facility. We sincerely thank them for hosting us this year!